The new quality center in Leipzig embodies the significance that quality has at Porsche. Teamwork is the watchword in every area—such as the recent production launch of the new Panamera. Stefan Fuhrmann deftly slips on a white woolen glove. Not because of the ambient temperature—that is a constant 22 degrees Celsius at his workplace in the MSB bodyworks at the Porsche plant in Leipzig—but to augment his sense of touch. He slowly traces the contour of an unpainted sheet of metal in front of him with his right hand and draws a few rings on it with chalk. Fuhrmann’s chalk markings mean: scratches, dents, flaws. “Such rough irregularities as the ones on this piece are naturally only used for demonstration purposes,” explains an employee from the department of quality control for purchased / pressed components (PLG-QK1). In their everyday work, the deviations from the norm that he and his colleagues are called upon to notice are generally much less conspicuous. “When a press exerts 1,000 tons of pressure on a part,” says Fuhrmann, “even a human hair would be visible on it.” At least for specially trained employees such as him—after all, recognizing irregularities of just a hundredth of a millimeter takes years of training. Not even state-of-theart scanners, which are also used in Leipzig, could detect such minuscule production flaws,” adds Dr. Andreas Schmidt. The Director of Quality at the Leipzig location (PLG-Q) therefore regards this type of manual inspection of vehicle components as something like the blue-ribbon discipline. This focus on quality is particularly evident in the brand-new Leipzig Quality Center (QC) — and not just because of the name. The roughly 6,000 square meter building opened in June. Investment: €15 million, plus furnishings. The center employs 150 staff, roughly 30 of whom were employed during the latest expansion. Particularly in the run-up to series production of new vehicles—like for the Panamera, the second generation of which will be manufactured in Leipzig and which celebrated its world premiere in late June—the Quality Center is a key prerequisite for enabling the highest degree of perfection from the outset. Beyond design and technology, after all, customers also place great importance on fine craftsmanship, the feel of the car, the tangible quality of each element. This “sensual quality” is, alongside the emotional, the functional, and the service quality, a pillar of the Porsche quality philosophy—and one of the reasons that Porsche has claimed a perennial spot in the upper ranks of the renowned international quality rankings of the J.D. Power market research institute. This annual study involves surveying customers in the US and China in relation to the quality of their new vehicles. 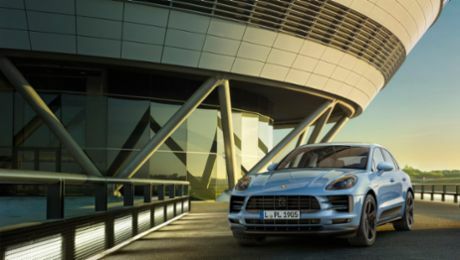 The Leipzig built Macan received the “Highest Initial Quality— Compact Premium SUV” distinction in its first year of full availability in 2015, and repeated this feat in 2016. Back to the Leipzig QC: There are nine test benches, offices and a large conference room. It is also from here that the Executive Board examines vehicle quality at the location once a month. The outside master jig used for preseries qualification of body components, for instance, provides a useful tool for visual evaluation. Among other factors, the QC analyzes how various components function together overall. Do they have the right flow? Is the seam pattern harmonious? These and other factors are examined down to the tenth of a millimeter— as with cubing, where the testers install all interior components in a complete body milled out of aluminum in order to see whether the seats, mirrors, headlights and the like fit exactly the way they should. In the “final audit”, which also takes place in the QC, complete vehicles are examined with painstaking meticulousness for up to eight hours in representative sample testing—and under an especially harsh light that reveals even the most minute flaws. “The decision that Porsche made some time ago to modify its evaluation system in terms of the scale in the audit has resulted in a further, significant improvement in the aesthetic quality,” says Martin Hübner, Quality Control Complete Vehicle Panamera (PLG-QL). But that’s not all: Vehicles in Leipzig are also selected for dynamic customer approval based on a sophisticated system. Over the course of a 65-kilometer test drive, including a bad-road section, audit staff examine parameters such as audible noise, watertightness and driving functions at higher speeds. “If there’s a deviation, it’s my job to fix it and ensure a proper delivery quality as quickly as possible,” says Hübner. The new Panamera in particular represents an enormous technical development both functionally and in terms of the body. In light of that development, the full design of the new Panamera was examined in detail in the QC pilot hall, from the painted body through commissioning. Up to two pre-series vehicles can be set up here every day. Each work step is monitored, analyzed and optimized by a special team. Ergonomic aspects such as the accessibility of the components, correct use of tools and mountability play an important role here as well. “Ergonomics is not just about reacting when the product is on the line, and is also about designing new products for which ergonomic considerations have been incorporated from the outset,” emphasizes Anne Heinze. As the Coordinator Ergonomics (PLG-PO), she knows exactly how important this topic with regard to quality as well. “Good ergonomics in the workplace makes workers more motivated, which tends to lower the potential for errors as well—and that means high-quality products.” For this reason, Porsche Production System and Porsche Improvement Process department (PLG-GP) were involved in a collaboration to add an ergonomics module to the assembly, paint and bodyworks training centers in Leipzig, where employees are qualified for their respective jobs. Moreover, employees are trained in model-specific activities in the socalled “pro room”. “This is where employees learn a variety of good approaches allowing them to vary the physical strains that result from ergonomically adverse postures in their daily work on the line,” as Heinze says. His colleague Alexander Fijak from the Pre-production Series Control department (PLG-AM2.1-VS) concurs. “If certain areas do not conform to our high standards, measures are defined together with the individual departments of development, planning and control in order to achieve the specified quality objective by the next pre-series step.” In relation to the new Panamera, he regards it as a major advantage that the car is now being built in full in Leipzig. “This allows us to influence quality across the board and respond more quickly.” And the support that the pre-series team lends to the colleagues in production is assured for three months after the start of production. The “final” quality authority in Leipzig, so to speak, is represented by Olaf Ischner and his colleagues in New Vehicle Preparation (PLG-VO2). “We’re a post-production line control point,” he says. When Ischner finds damage on a vehicle during his tests—such as to the paint during transport within the plant— he immediately communicates that within his team. “Then my colleagues can look for the same issue on other cars.” Across the different teams, damage is reported to the line managers and analyzed as quickly as possible by them in order to eliminate underlying errors in production immediately. When it comes to the vigorous growth of the Leipzig location, two other departments are also playing an important role with regard to quality: the infrastructure and the qualification of employees. “For us, quality begins with planning the projects,” says Marco Raue, Project Manager for Plant Structure Planning (PLG-X). He was responsible, among other things, for planning and commissioning the new cafeteria III at the location. “We take a very precise look at our suppliers, always insist on being shown reference properties, and speak with the respective operators. That gives us the certainty that the workmanship will later conform to our demanding requirements.” Raue also emphasizes that this would not be possible without teamwork. “We work closely with many internal and external specialist planners.” Challenges are discussed weekly in team meetings and solutions discussed together. In terms of the growth of the location, he sees the primary challenges in overarching issues such as the conservative use of space and the ever-increasing traffic flows. In the future, the objectives for her department, she says, will direct a focus on further centralization of the technical measures in order to enhance the synergy effects based on the experiences of different technical fields. “We’re also currently working on the introduction of the dual study system, and are expecting the first students in Leipzig in September.” To continue to improve the quality of qualification, Porsche Leipzig also wants to establish e-leaning options for its employees wherever this offers potential. “Moreover, we’re currently building our training and qualification center, in which modern classrooms will provide the perfect setting for training and continuing education courses for our employees,” says Porsche. The center will open at the end of the year—and will contribute to making quality at the Leipzig location even better yet. Fifth expansion: Porsche is investing more than 600 million euro to expand its factory in Leipzig. A natural paradise for both wild animals and Porsche customers with their Cayenne and Macan. Press representatives had the chance to drive both the Panamera Sport Turismo and the Panamera Turbo S E-Hybrid.